“I know I’m not flesh and blood. No nerve endings. No heartbeat. Just a robot with artificial emotions and a disposable body. I know I’m not really human. Could there be a better way for a graphic novel newbie to start exploring the world of graphic novels, than with the graphic continuation of one of her all-time favorite series? Not for me! I’m thrilled that I got to read Wires and Nerve, volume one, and I definitely want more. More graphic novels in general, but also more Wires and Nerve. 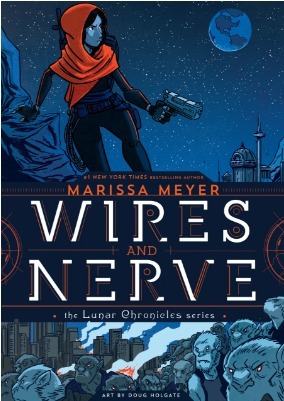 In case you were not yet aware, Wires and Nerve is a graphic novel spin-off of The Lunar Chronicles, focusing on Iko, the lovable and funny android who wishes she were human. The story takes place after the Lunar Chronicles, but before the Stars Above epilogue. And for my first graphic novel, it was a wonderful experience. I loved getting sucked back into the world of The Lunar Chronicles. While the worldbuilding was already so well done in that series, I felt like the art in this one really helped bring it all to life again. But what I loved most of all about this, was being reunited with one of my favorite groups of people. We mostly follow Iko as she hunts down rogue packs of wolf-hybrid soldiers, deals with prejudice because of her android-status and helps her friends out, all while maintaining perfect fashion-sense and her own wonderful sense of humor. But of course we also get to meet the rest of the gang again, though some more so than others. I loved seeing everybody again and was reminded why I loved them so much to begin with. And I felt like everybody was still so very much in character. The character interactions also still felt so… right. The friendship and mutual respect between Cinder and Iko is still so present and a driving force in the novel. Also Thorne and Cress get quite a bit of screentime (story time?) and they are still adorable as ever. Thorne reminded me again why he’s my favorite character. Scarlet and Wolf, Winter and Jacin, and Kai get just a little less time to shine, but I’m sure they will get their chance in the second volume. And of course, we can’t forget Kinney, who shares some quite hilarious scenes with our lovely Iko as well. The humor and wit is also still on point as the novel had me laughing out loud for at least half the time I was reading it. But even though it’s funny, the story also knows when to be serious and we do get to see some great political scenes and some scenes to make you think. My only downside to this was that it was over in about two hours and while it was a lot of fun, it still felt like it was only a recap of the Lunar Chronicles and then an introduction to the new story. Just when I was really getting into it, it was already over and now there’s still a year to wait for more. So maybe I’d recommend putting this off until the second volume is out so you can have the pleasure of binge-reading both. Overall, I felt like this was a great graphic novel for fans of The Lunar Chronicles. It’s definitely a worthy successor, featuring all your favorite characters and bringing back the amazing worldbuilding and wonderful humor that you already know and love. Have you read Wires and Nerve? What did you think about it? I am definitely going to have to check this one out! I used to love graphic novels but it’s been a long time since I’ve read one. And what better way to dip my toes back into the graphic novel pool, than with a graphic novel based on a series I’ve been loving. I have only made my way through the first two books in The Lunar Chronicles so far but I’m loving it. I have Cress but haven’t found time to start it yet. Glad you enjoyed this one! Okay, your review makes me super ready to read this right now. I had heard some so-so reviews earlier that made me hesitant to read it, but I mean what could really go wrong? The Lunar Chronicles and graphic novels. Pretty much the best combination ever. Emily Seals recently posted…five authors I’d love to meet. I know, I saw some mixed reviews as well so I was a bit hesitant to start this one. But for me personally, it was definitely a great novel. Of course it’s not AS GREAT as The Lunar Chronicles, but I still thought it was a fun and well-done continuation 🙂 Hope you’ll enjoy! Melissa (Books and Things) recently posted…WTF Netflix???? Oh yes, if you like the rest of The Lunar Chronicles (I personally thought it got better with each next book), then you’ll probably enjoy this graphic novel as well 🙂 Hope you’ll enjoy! I haven’t been reading as many graphic novels but this one looks interesting, even though I haven’t read Meyers’ stuff. And continuing a favorite story in graphic novel form is awesome. It was my first graphic novel, so it was indeed awesome to continue a story I already knew and loved in graphic novel format 🙂 Definitely gave me the interest to check out some more graphic novels in the future! OOOh I’ve only read Heartless from Meyer and I haven’t read the Lunar Chronicles so I probably can’t read this one yet but hopefully soon! A graphic novel sounds very cool! Thanks for the awesome post Lindsey! Oh, I haven’t read Heartless yet so we both still have some Marissa Meyer to look forward to 🙂 I was hesitant to start The Lunar Chronicles but ended up really loving it, so hope you’ll enjoy it too! That’s so great that you’re currently reading the Lunar Chronicles! I’d love to be able to read that series for the first time again myself 🙂 And Wires and Nerve was my first graphic novel as well 😀 Hope you’ll enjoy the rest of TLC and this one! Omg I love the Lunar Chronicles so so much even though I have yet to read Fairest, Winter, Stars Above and this one.? great review Lindsey! I have heard quite mixed things about this one but your review gave me some confidence to pick it up lol?❤️?